Valve has confirmed more than a dozen manufacturers of Steam Machines, with prices ranging from $499 to a down payment on a house. The Digital Storm Bolt II that was unveiled this morning is a $2500 powerhouse but Valve Grand Poobah Gabe Newell confirmed that a range of machines, at a variety of prices, will be available. "The first generation Steam Machines offers something for every gamer, which is a critical part of extending Steam into the living room," he said. CyberPowerPC and iBuyPower will produce systems for as little as $499, while Falcon Northwest rigs will start at $1799 and go as high as $6,000. The systems themselves come in a variety of configurations based on both AMD and Intel CPUs, and Nvidia and AMD GPUs. Storage ranges from 500GB to 6TB, with some SSD options - but bear in mind that these are only promotional examples, and that actual configurations - and prices - will vary. In fact, while we don't have an overload of detail at this point, it's becoming clear that the "Steam Box" is less a thing than an idea, and a rather murky one at that. 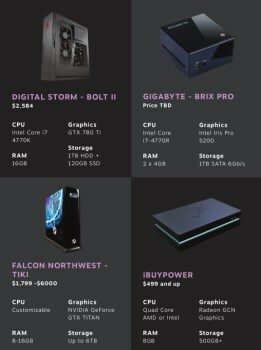 Some of these systems, like the iBuyPower or the Zotac, look like consoles, but the Falcon Northwest and the Digital Storm are clearly just high-end gaming PCs. That shouldn't be a surprise - Steam is a PC-based platform, after all - but if Valve wants to compete for the living room then it's unavoidably competing against consoles, and in that light the lack of uniformity is a little unexpected.